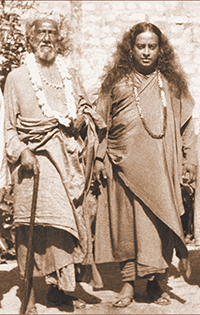 In the Autobiography of a Yogi, Paramhansa Yoganandaji describes his intensive spiritual training, as young Mukunda, under his sublime guru Swami Sri Yukteswar in the Serampore hermitage on Rai Ghat Lane. 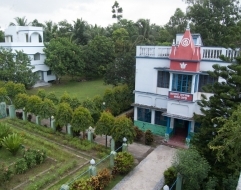 Yoganandaji studied at th e Serampore college from 1913 graduating with an A. B. degree (Bachelor of Arts) in 1915. In his autobiography, he fondly recalls, “setting out on a bicycle at nine-thirty in the morning. In one hand I would carry an offering for my guru -- a few flowers from the garden of my Panthi boarding house” to visit his Guru at his hermitage; “And after hours with his Guru, and helping with ashram duties,” he would “reluctantly depart around midnight for the Panthi.” Occasionally he stayed on all night with his guru, “so happily engrossed in his conversation” that he scarcely noticed when darkness changed into dawn. It was at this hermitage that young Mukunda had, in 1915, been ordained into sannyas by his beloved Guru--whereupon he became Swami Yogananda—and it was also here that, in 1936, he received from his Guru the supreme title of Paramahansa. Shortly after his sannyas, encouraged by Swami Sri Yukteswarji Yoganandaji started an organization—first at Dihika in 1917 and a year later,at Ranchi--in order to share the nectar of India’s ancient spiritual wealth with interested Truth-seekers across the globe. After Sri Yukteswarji’s Mahasamadhi, YSS acquired a part of the hermitage property. In honor of Swami Sri Yukteswarji and in the memory of his monumental role behind a worldwide mission (manifested through gurudeva as ‘Self Realization Fellowship’ in USA and ‘Yogoda Satsanga Society of India’ in India) a Smriti Mandir was dedicated in 1977 by Sri Sri Mrinalini Mata (presently the President and Sanghamata of YSS/SRF) assisted by Sri Uma Mataji; Gurudeva’s youngest sister Purnamayi Sarkar (Thamu)—then a resident of Serampore—was also present during the dedication ceremony. At present, group meditations are conducted at the Smriti Mandir every Saturday. 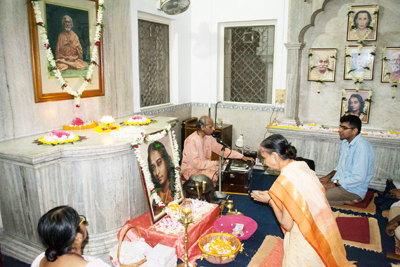 Commemoration of Avirbhav Divas of both Yoganandaji and also of his Gurudeva, Swami Sri Yukteswarji are regular yearly features which draw large attendance from devotees, friends and local inhabitants of Serampore. With the addition of several rooms, this place has started to serve—from 2012—as a retreat center--complete with dining facilities--where devotees can spend a day or two for their personal retreat. This center also includes a beautifully designed book sale counter where YSS publications are available. A Sunday school also operates at this site where “How-to-Live” principles of Paramahansaji are imparted to young children with the help of enthusiastic YSS devotees who volunteer in this programme. On Rai Ghat Lane—along which Yoganandaji often strolled with his Guru—YSS also runs a homeopathic dispensary with the help of experienced doctors and an able team of dispensers, a reason for its wide popularity, among the locals as also among patients from distant areas. N.B. - For special commemoration services and celebrations the details of program and special meditation schedules are published separately in our website. Local trains are available from Howrah railway station and it takes 40 minutes to reach Serampore. From Serampore railway station, the retreat is a 10 min walk or one can hire cycle-rickshaw. From Dakshineshwar, it is 15 Kms away. One can either take a bus from local bus depot which stops in front of the retreat, or can avail local train services from Uttarpara railway station (on the other side of Ganga).